Elliptical trainers may be one of the friendliest machines in the gym. All you have to do is step into the pedals and walk or run. Since your feet never leave the pedals, you don't have to tolerate the repeated pounding impact of each footfall on a treadmill -- an elliptical workout is both quieter and more comfortable. If you like elliptical trainers enough to invest a minimum of several hundred dollars for a quality machine, you can even bring the many benefits home with you. One of the elliptical trainer's primary functions, and arguably its most important, is stressing your cardiovascular system. Like any other muscle, your heart responds to appropriate levels of stress by getting stronger. The Centers for Disease Control and Prevention recommends that to achieve health benefits, you should do at least 150 minutes of moderate or 75 minutes of vigorous cardiovascular exercise every week. Personal trainer-designed workouts and heart rate monitoring, available on some elliptical trainers, help you monitor and control your workout intensity. Elliptical trainers work your quads, glutes and hamstrings. Your calves also work, but to a lesser degree. If your elliptical trainer has an adjustable incline ramp, you can emphasize the calf workout by adjusting the ramp to a steep angle. Most mid-range and high-end elliptical trainers have moving handlebars you can push and pull for an upper-body workout, and they also allow you to pedal backward for variety. 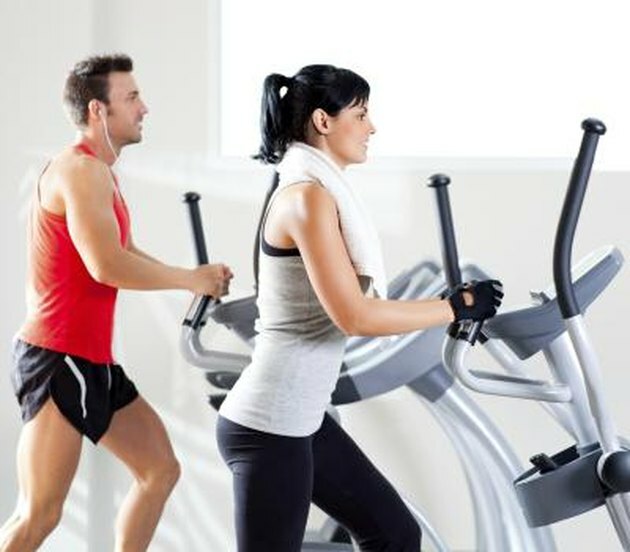 As you exercise all your major muscle groups on the elliptical -- including your heart -- you also burn calories. According to Harvard Health Publications, if you weight 185 lbs. you can burn about 800 calories per hour on an elliptical trainer. But since you control both your own pedaling speed and the machine's resistance, you determine your workout intensity. Harder workouts mean more calories burned. Burn 3,500 more calories than you've taken in, spaced over as long a time period as you like, and you will have burned the equivalent of 1 lb. of body fat. Don't mistake an elliptical trainer's full-body workout for strength training. But training on an elliptical does help you develop muscular strength and endurance, which translates into greater ease with everyday activities. Pedaling an elliptical trainer can also help reduce mineral loss in the bones that bear your weight. Regular cardio workouts also reduce stress, improve your mood, boost your immune system and reduce your risk of developing obesity-related diseases. Some users report foot and ankle numbness after extended elliptical trainer workouts. Elliptical trainer manufacturers have begun producing machines with a very slight inward slant to the pedals to combat this problem. No matter how much you love your elliptical trainer, give yourself at least one day of rest every week. The recovery time will reduce your risk of overtraining, which can lead to an increased injury rate and other symptoms like insomnia and irritability. American Council on Exercise: What is Overtraining? Does an Elliptical Shape Your Leg Muscles?